The Virbac equine team will be attending the British Equine Veterinary Association Congress, held from 12th to 15th September at the ICC, Birmingham. 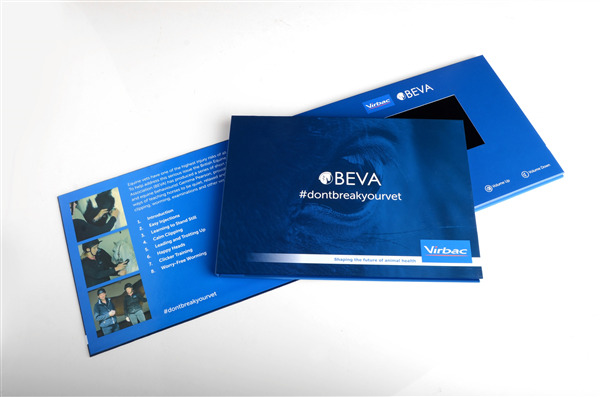 This year, Virbac have joined forces with BEVA to promote equine vet safety through the hugely successful “Don’t break your vet” campaign. Visitors to the Virbac stand can claim their free video book containing the popular “Don’t break your vet” videos that were streamed on social media earlier this year. The hard back books provide another opportunity for horse-owners to view the content and are perfect for client waiting areas. Limited to one book per practice, don’t miss out on the chance to claim yours! Congress delegates are also invited to join the team for cheese and wine during the happy hours on Thursday 13th and Friday 14th September. The team will be on hand to discuss the ever increasing Virbac Equine product range, which includes Inflacam Granules® the only meloxicam granules on the market, and the latest addition to the Virbac equine sedative and anaesthetic range, Torphadine®. Inflacam Granules® contain meloxicam, legal category POM-V. Torphadine contains butorphanol, legal category POM-V. For further information contact Virbac Limited, Woolpit Business park, Windmill Avenue, Bury St Edmunds, Suffolk, IP30 9UP; Tel: 01359 243243 Email: enquiries@virbac.co.uk. W: www.virbac.co.uk. Use medicines responsibly.